It's not often I have to get past an armed policeman and be challenged by a soldier for acting suspiciously in order to photograph a plant. Or rather - it's happened only once and that was on Thursday last week. You may have noticed I've been a bit missing recently. And over the years you will almost inevitably have noticed there are certain things which pre-occupy me which don't often bother other people. And I encourage you to join in with some of them: with following the life of a tree for a year; standing still to see what one can see without moving; and looking for wild plants in towns. I'm an enthusiast - and I've developed theories. 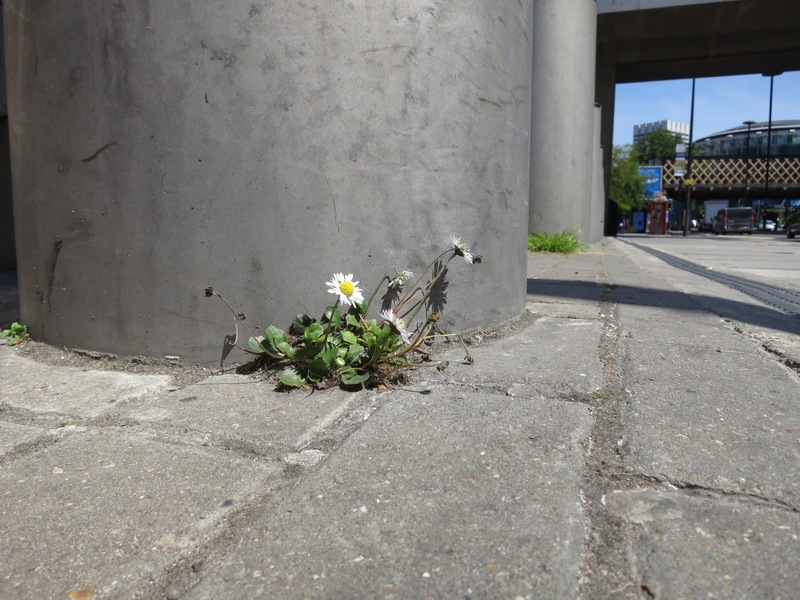 For instance, as you, know - that wild plants are everywhere, even in the most unlikely places. So this week, for my latest challenge, I set out to prove it in central London. I was absolutely convinced that while visitors are busy looking at things like the Lions in Trafalgar Square they miss plants growing by their feet. You might not think this matters. Maybe it doesn't. You're not going to come all the way from America or Spain to see a weed which you can see in a drain any old day at home. But in a way it does matter. It matters a lot because to miss these little scraps of determined life is like missing Narnia because it's at the back of a cupboard. Ornithologists might say the same about birds (I don't know). An entomologist might say the same about insects. A micro-biologist might have a field day! But my 'thing' by chance, pure chance, has turned out to be plants. I'm not even that interested in plants. (I'm definitely not interested in birds.) But we humans can't cope with the everythingness of everything and plants were the specific which sort of crept up on me. My grandmother used to take knitting with her everywhere. She was a diffident, shy person and knitting became her important and portable familiar. She churned out more twin-sets than she'd ever need or could be worn by her extended family. (You remember twin-sets? Short-sleeved jumpers in three or four ply wool (very thin) worn with matching cardigans.) I don't suppose she thought of her knitting in this way - but it meant she could sit silently without people ever thinking she was odd or unfriendly. And she could talk if she wanted because she knew the pattern by heart. where taxis draw up to collect people arriving in London by train. So . . . I went all the way to London to prove my theory - that wild plants grow everywhere. London is three hours away on the train. Three hours there. Three hours back. On a freakily hot day. And trains are expensive. All that way to find plants in Trafalgar Square - and there were none. The very centre of Tourist London has gone mad on cleanliness. Ken Livingstone chucked the pigeons out of Trafalgar Square when he was Mayor - and now the lions shine and people sit happily on the steps and children chase each other round this big, safe area. It seemed sad at the time. Pigeons were part of the place. You could buy seeds to feed them with and they would come to sit on your arms and shoulders to eat. But they didn't 'arf make a mess! And instead of drifting away because they can no longer feed the birds - the square has filled up with holiday makers, and picnickers, and street performers and on the say I went there was a demonstration opposing the privatisation of visitor services at the National Gallery and the re-instatement of a union representative who's been sacked over the issue. Daisies between Waterloo Station and the London Eye. The curved building beyond the bridges is the London IMAX. I don't know whether there were plants in Trafalgar Square when pigeons were there but neither are there now. Eventually I found a patch of short grass about an inch across at the edge of a drain in a kerb. That was all. I looked up at the buildings around it that used to be dark with soot but which now sparkle in the sunlight, and I looked beside the benches. No plants. No litter. NO LITTER! How do they do it? They'd even emptied the water from the fountain and were cleaning that out too. Such exemplary house-keeping. And yes, the result is fantastic. The result is fantastic but my theory totally demolished. You can't keep a good fanatic down. Especially if that fanatic is me. Up and down the side streets; getting hotter and hotter; thinking of that train fare; even the very expensive cup of coffee I'd bought for the sake of a sit-down and a break from the heat. Back to Whitehall where government offices are centred. Another of Ken Livingstone's legacies is to have reduced the volume of traffic in London. Of course there were buses and cars but the noise wasn't overwhelming. Thinking back on it, it was silent. It wasn't. You don't get silent buses, even in London. It was the silence of concentration. And then of admiration. 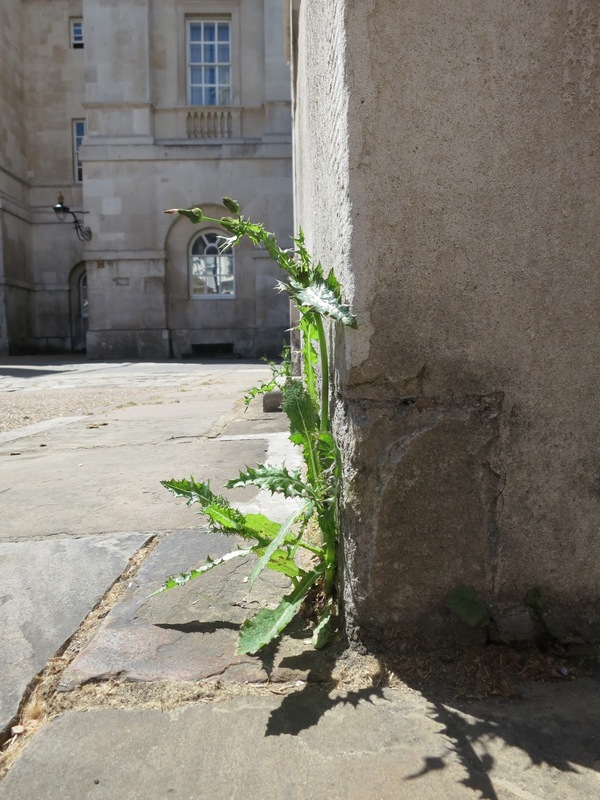 A solitary plant grows on a wall against the Cabinet Office in Whitehall. Above the railings at the end of the picture you can see the street name - Downing Street. At the top left you can see the union flag (union jack?) flying on the top of parliament. Seriously, how can you not but admire this plant? When you see Downing Street (official residence and work-place of the Prime Minister and Chancellor of the Exchequer) on the news you tend to see the door of Number 10. But Downing Street in itself isn't spectacular. It's a narrow cut between the huge, stone, sombre and impressive buildings of The Cabinet Office and The Foreign and Commonwealth Office. (Defence is down another street over the road.) And here, here at last, I found nature gone wild. 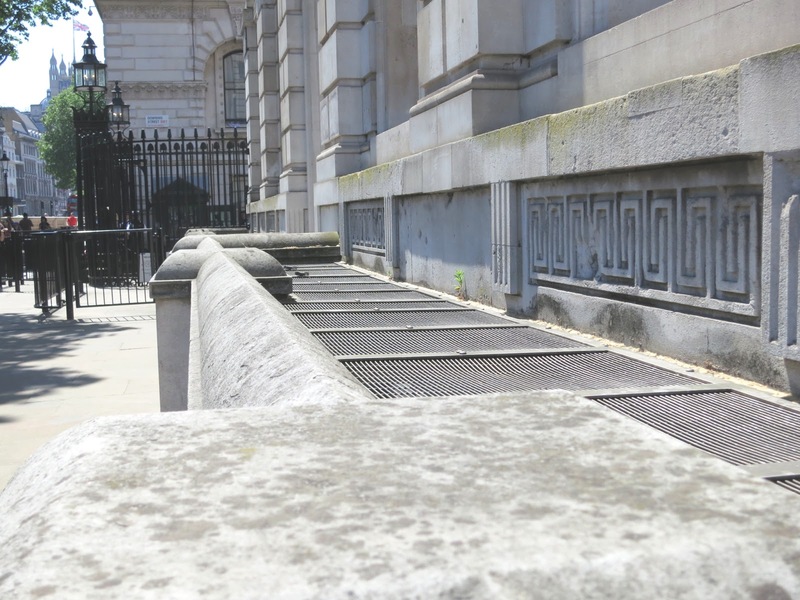 There was a pile of leaves caught behind the Downing Street barrier and, wonder of wonders, a solitary plant on the wall of the Cabinet Office and another in the basement of the Foreign and Commonwealth one. But how? How are they there when all else is swept away? And do you know the Horse Guards in Whitehall? They wear bright red jackets and plumed helmets and sit silently on still horses under the shelter of sloped roofed boxes either side of a gate to a small yard and an arch under a building that opens out into Horse Guards Parade. the Horse Guards on their Horses in Whitehall and Horse Guard's Parade Ground. Well, in between the Horse Guards and the arch into this vast parade ground, were two plants against the wall. Again, how do they hang on there when everything else has been swept away? Especially when they both were about a foot tall. But between the mounted Horse Guards and the entrance was a cluster of police with semi-automatic machine guns (carbines) clutched across their chests. And although they were letting everyone pass there was an extra policeman (with gun) between me and these two plants. So I asked if I could go behind him to take their portraits. I have strong legs. The rest of me is pretty feeble but my legs are strong. Blame it on the plants. I can crouch easily and steadily. I can even hop backwards in a crouched position. And I have no inhibitions about crawling up and down when there's a camera in front of my eyes. Imagine it. Soldiers on horses. Police with guns. A crowd of tourists admiring this famous London scene - and me crawling and crouching and hopping up and down all on my own along this guarded wall. You know the kind of farce where one of the characters is crawling along the ground; say, looking for a dropped ring; when they come unexpectedly against the legs of authority? In my case it was a soldier in the kind of camouflage which might have worked in woodland if he stood still but which made him stand out disconcertingly clearly in a Whitehall Courtyard. "What's she doing?" he asked the armed policeman. "Photographing the wild flowers," he said in a voice which showed he thought this was a perfectly ordinary and sensible thing to do. Wonderful man! "I looked for plants in Trafalgar Square," I explained. "But there were none, so I came here." "It's because of the pigeons," he said. I doubt if he's reading this - but if it's you and you are - Thank you! There's a post-script. I don't know who looks after the different parts of tourist London but the closer you get to Waterloo Station the street cleaning regime gets increasingly relaxed. between Waterloo and the London Eye. Wild London may find it hard to get a look in; but it does. All photographs in this post were taken on June 11th 2015. 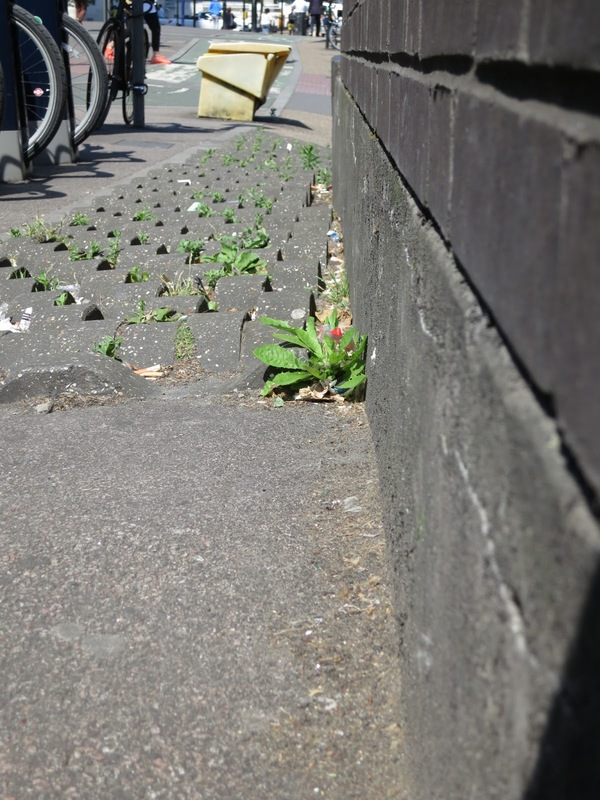 Link Box for Street Plant Posts from 21st - 25th June. What a wonderful post, Lucy! 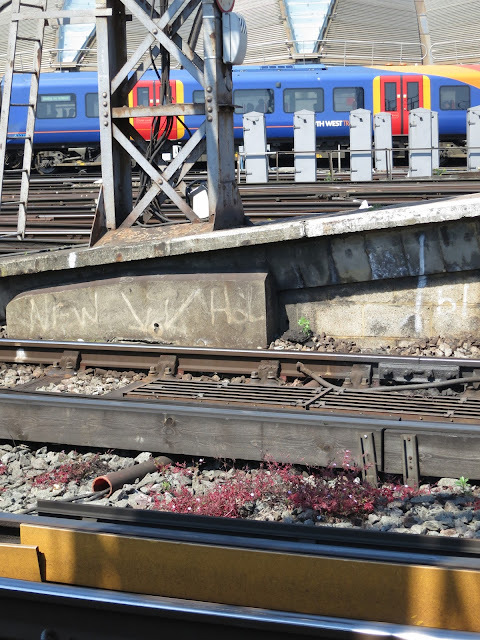 I still remember when I used to commute to London from Suffolk that the best part of my day was going into Liverpool Street Stn and seeing all the plants (mostly buddleia) on the embankments just before you hit the gloom of the station - used to wish I was as tough. And when I lived in a scruffy little town in Alsace there was a fig tree that used to grow up through the metal grating (drainage?) in front of some flats. Periodically someone chopped it down but it always came back (over the four years I was there). What a quest you were on for those survivors in what is (to a plant) a war zone! 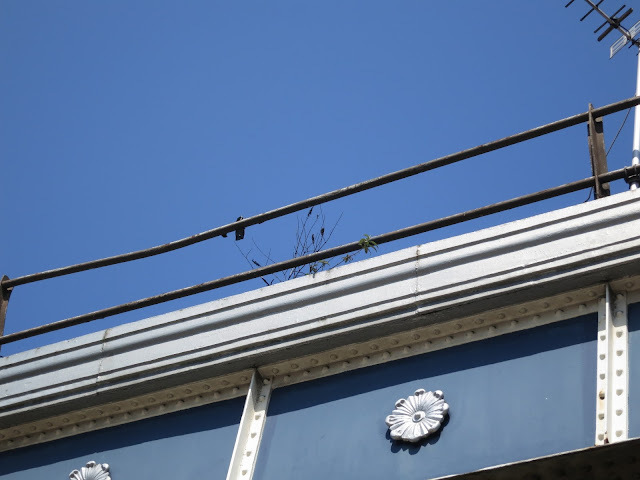 Pigeon droppings and seed maybe? But that wouldn't account for the wild flowers would it. A heavy toxic regime of sprayed weedkillers? 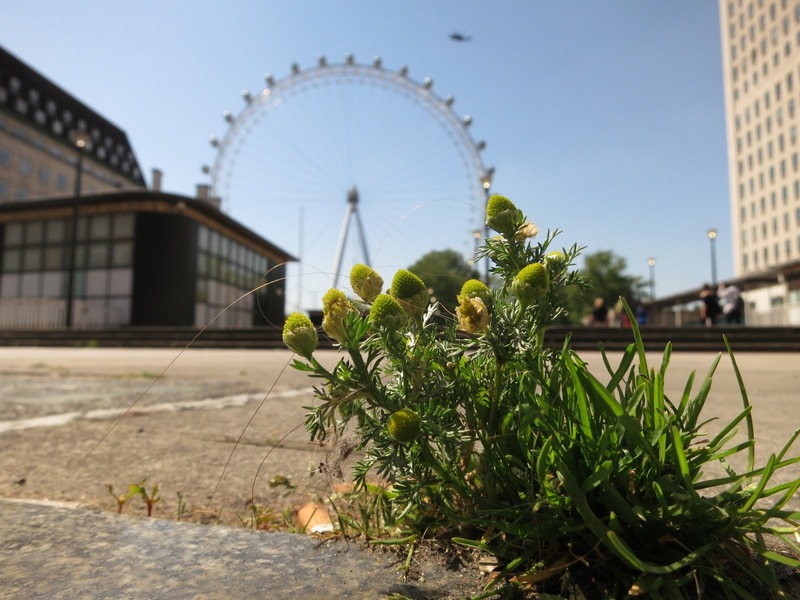 I find it very sad to think of central London with so few wild plants growing. Lucy, I found this report of your day trip to London to be strangely affecting and I enjoyed the backstory. I would miss the pigeons in Trafalgar Square. Those thistles are tough! A most enjoyable, and indeed fascinating, post with interesting pictures. I find it sad that although London has plenty of green spaces it generally does so little to green the streets so to speak. Great post Lucy. It really put a smile on my face. Your writing is so personal, I love the way you put a post together. I admire your resolve for all wild plants and the lengths you go to to prove your point. I am so glad that at least you found one or two and the journey wasn't all wasted. I think London is like Edinburgh - the city centres are kept immaculate whilst the surrounding areas and suburbs are left for the good of the wildlife. Or at least that's what they tell us. Our grass verges should be cut this week, the Royal Highland Show is on over the road and it's always made neat and tidy in time for Her Majesty's visit to the show. What a great post. I got so engrossed I read it all even before my first cup of tea of the day. When I first saw your headline I thought it was going to end in tears and that you were going to be arrested and fined, so I am glad that the expense was only the rail fare! I'm so glad the police and soldiers were human after all. Do the pigeons eat the greenery, then? I have always considered London to be "another country" and have no wish to go there these days. But your pictures are lovely, especially the pineapple mayweed, which I had never heard of before. So much in this post - one of your best! I really enjoyed this post. It was thoughtful and funny and informative. Love the soldier story. I share your interest in street weeds (yesterday found a bee orchid growing in a derelict petrol station). And I've also found weeds grow more abundant the further you go from where the moneyed people walk. Great post Lucy. When I was at college I wanted to do my final year Botany project on wildflowers on the railway tracks at Waterloo. needless to say it was never going to happen, H&S rtc etc. I ended up wandering (alone) across saltmarshes and mudflats down in Kent. Well done and I will be entering some photo's later in the month. I did enjoy this and it made me smile. I love the image of you crawling around among the thugs with guns and them being very nice despite their weapons. For me Trafalgar Square is now just too full and when I last went there I was very put off by the row of mime artists, one mime artist I can just about cope with but a whole row, just too touristy. It was funny -- I saw "expensive" in the headline and references to police and soldiers in the first sentence and figured you had been ticketed or even arrested while photographing street plants! Glad to hear it was an expensive train ticket instead. And already it's street plants time! dear oh dear I'm so busy. But there's a little patch of urchins growing out of the asphalt near my curb. I will at least post their portrait, if I can catch them when it isn't raining or windy. Great post I read every word and then went back and read it again. It made me laugh and it made me think, thank you.